Students work from 9.30 to 5 every day, with a break for luncheon, except on Saturdays, when all classes cease at 1 p.m. 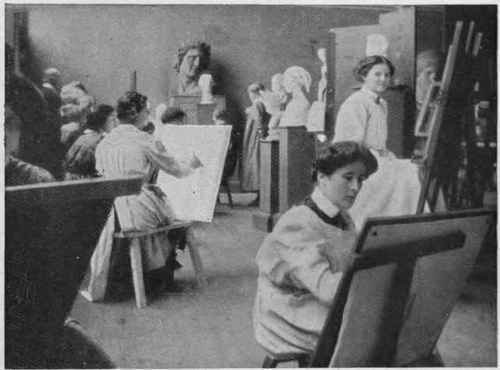 Both figure and draped models pose every day in the Women's Life Classes. 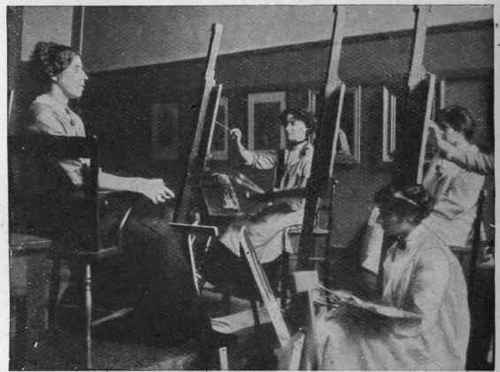 The college provides seats and easels, but students. must furnish themselves with the other materials and appliances they require. The Slade School is one of the largest in London; there are 125 women students working there during the present session, and 54 men. These fees entitle students to the full courses of study at the Slade School, as well as to attendance at such courses of lectures as the professor may advise. Students can also join for the half-term, working for six days a week for four guineas, and three days a week for two and a half guineas. These fees, however, do not entitle the students to attend the courses of lectures. Students may also be admitted to the classes for a month at a time on recom-mendation of Professor Brown, on payment of a fee of three and a half guineas for six days a week, or two guineas for three days a week. Sir Edward Poynder is Visitor to the school, and Slade students are to be congratulated on the fine band of distinguished artists, numbering some of the most brilliant and original portrait landscape painters and draughtsmen of the day, who form the teaching staff. Professor Frederick Brown is Head of the school; the Assistant Professor is H. Tonks, and his assistant is Mr. W. Russell. The assistant teacher of painting is Mr. P. Wilson Steer, and the assistant teacher of drawing Mr. D. Lees. Special lectureships at the Slade School on anatomy, the history of art, and perspective are held by Professor G. D. Thane, Mr. Roger Fry, and Mr. Thomson respectively, while lectures on special branches of art are also given by the University College professors of architecture, archaeology, and Egyptology. All students must attend the course of lectures on perspective which are given during the first and second terms of each session, unless specially exempted by the professor, and they are advised to consult Professor Brown individually at the opening of the session as to the further courses of lectures they should take. Besides prizes amounting to ,£80 a year, there are two scholarships, each of the value of 35 per annum and tenable for two years, which may be awarded at the end of each session. Competitors must not be more than twenty-one years of age on June 30th in the year of competition, and must have attended the school during the whole of the session - three terms - in which they compete. They must also produce satisfactorv evidence of having studied with credit in some public school or approved place of secondary education. There is a delightful organisation - the Women's Union Society - at University College, to which every* woman student may belong. Among the privileges to which a girl member is entitled is the use of the union reading and writing rooms, the use of the asphalte tennis-court, of the gymnasium, and of the athletic ground and pavilion, and the membership of any or all of the athletic and other associated clubs - the hockey club, tennis club, boating club, gymnastic club, swimming club, magazine club, common room tea club, and debating society. Thus, tastes of every sort and kind may be gratified, while the subscription is only £1 IIs. 6d. for the entire session, or, if the student has paid her sessional fee of £21 for the three terms, at the beginning of the session, she can join without any further subscription. Another splendid institution in connection with the Slade School and University College is College Hall, in Byng Place, Gordon Square, an extremely comfortable and well-appointed house less than five minutes' walk from University College. It is under the care of the principal, Miss Lindsell, M.a., and here women students studying at the Slade School can be accommodated during term time. Girls coming from the Colonies, abroad, or from remote parts of the country, moreover, can make it their headquarters all the year round, with the exception of the month of August and two or three days at Christmas and Easter, when College Hall is closed. There is a delightfully cheerful and homelike atmosphere about the house which well befits a place which takes the place of home to over thirty girls during the greater part of the year, and the expense of board and residence, including fire and light, ranges from 53 to £82 for the Slade School session of about thirty-three weeks. For a period less than a complete session (unless such period terminate at the end of the school year in July), an extra charge of ten per cent. 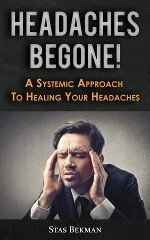 is made on the fees of one term.